Warren’s Celia Chase gets a lead off of second base during Tuesday’s game against Titusville at the Ed Myer Complex. Chase was 4-for-5 with 3 RBI in a 6-3 win that secured no worse than a share of the Region 6 title. TITUSVILLE – There was a thought going into the season by some pundits that Region 6 was wide open. Warren has essentially put that to rest. Ellie Lobdell struck out 13 and the Lady Dragons pounded out 17 hits, including a home run by their pitcher en route to a 6-3 win over Titusville that secured at worst a share of the Region title. 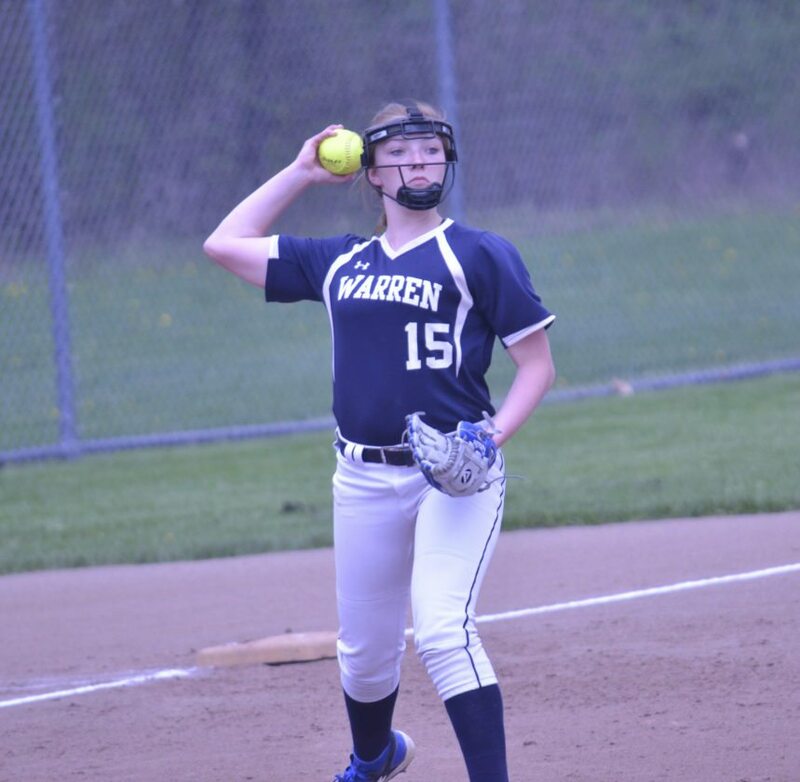 Warren, now 11-2 overall and 9-1 in the Region (two games clear of Harbor Creek and Corry), can wrap it up outright with a win over Franklin on Thursday. Warren third baseman Kiersten Hoffman throws to first for an out during Tuesday’s game at Titusville. The Dragons clinched no worse than a share of the Region 6 title with a 6-3 win. 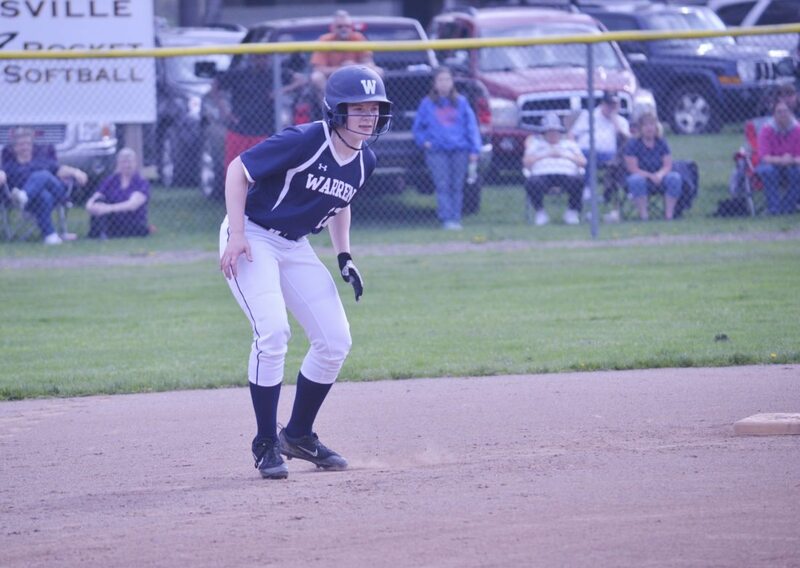 Celia Chase led Warren’s offensive attack, going 4-for-5 with three RBI, and she along with her teammates at the top of the lineup got things going right away in the first inning. Lex Nyquist led off with a single and Kelsey Stuart sacrificed her to second and reached on an error. Chase followed with a sharp single that brought in Nyquist and Gracie Wood’s RBI base hit knocked in Stuart to give the Lady Dragons a 2-0 lead. Lobdell, meanwhile, was on top of her game from the get go. She struck out the side in the first inning, and fanned 28 Rockets (4-7, 3-7) combined between Saturday’s game and Tuesday. All three runs against her were unearned, and she allowed just two hits. Jordan Sitler’s RBI single brought in Chase in the third for a 3-0 advantage in the third, but the Lady Dragons did leave the bases loaded for the first of two times. Titusville scored two runs without a hit in the third, aided by a pair of Warren miscues, but they remained unfazed. Julia Lobdell got the offense rolling in the fourth, leading off with a single and a double by Nyquist put runners on second and third. Chase came up and delivered once again, ripping a double off the fence to make it 5-2. Titusville cut the margin to 5-3 with another unearned run in the fifth, but Lobdell helped her own cause in the sixth, getting the run right back on a towering home run that cleared the center field fence by a wide margin. Lobdell got stronger as the game went on, striking out five of the final six batters she faced. In addition to Chase’s four hits, Nyquist and Sitler had three each and Stuart two. In fact, everyone in the Dragon lineup had at least one. They also got down several bunts, something that was a point of emphasis in practice. “We can play small ball and we’ve got power,” Sitler added. Warren now has the aforementioned game against Franklin on Thursday before traveling to Mercyhurst Prep on Friday. Warren’s Ellie Lobdell delivers a pitch during the first inning of Tuesday’s game at Titusville. Lobdell struck out 13 as the Lady Dragons clinched at least a share of the Region 6 title with a 6-3 win. Youngsville’s Austin Fitzgerald (right) comes over the hurdle just ahead of Eisenhower’s Michael Abadie (left) in their 300m hurdle heat during a meet at Eisenhower High School, Tuesday, May 8, 2018. Both runners set personal records in the race. Adam Irwin tossed a complete game shutout against Bradford on Tuesday. Warren’s bats stayed hot in the JV contest, pounding out 13 more hits in an easy win. Sitler, Hoffman and Morgan Munksgard had doubles, while Stuart, Munksgard, Mariesa Clarke and Ashleigh Deppen all had multiple hits. Kyleigh Wilson, Munksgard and Deppen all had multiple RBI. On the mound, Sitler struck out five in three innings of work and Stuart recorded all six of her outs via strikeout over two innings.